An electric trolling motor is one of the most useful and economical pieces of equipment you can install on your boat. They are excellent for stealth fishing and will save you a lot of cash because you are not paying for as much fuel. Not to mention they are so much cleaner for the environment, especially when compared with dirty two-stroke outboard motors. 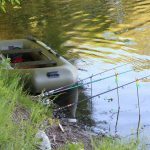 In this Quick Guide, we take a deeper look at electric trolling motors to help you decide on what you need. 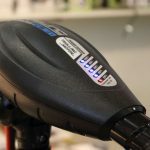 There are 4 main areas to consider when purchasing an electric trolling motor. 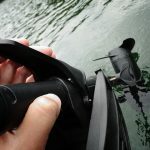 The shaft of the motor must be long enough to be fully submerged the propeller at least 30 centimetres into the water. 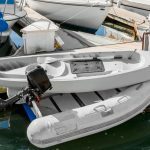 If you are going to place your motor on the bow of your boat, you must consider the impact of waves and ensure your propeller stays under water. It is always a good idea to follow manufacturer’s recommendations or look at what size shafts other boats of similar size are using. Most electric trolling motors come in 12 or 24 volts. This is very easy to understand. A 24 volt motor is capable of handling 2 X 12 volt batteries. Pounds relates the amount to the amount of power you are going to get out of your electric trolling motor. Pounds of thrust also directly relates to the amount of voltage. A 12 volt motor will have around 55 points of thrust, where a 24 volt motor will have around 80-90 pounds of thrust. A 36 volt electric motor can put out around 105 pounds of thrust. When using an electric trolling motor as your primary motor, or are using it mostly for trolling or moving very short distances, it should be mounted on the transom (back) of the boat. You will be in the back of the boat to control the motor by hand. Transom model motors are simpler to run as they are handled just like a standard outboard motor. In most applications of fishing, it is better to mount the motor to the bow as it is more efficient to pull the boat through the water than to push it. You will get maximum boat control, minimise over steering, and when fishing from the front of the boat you may be able to see underwater obstacles such as rocks and stumps. Control over your boat is a lot easier when you are pulling compared to when you are pushing. Electric trolling motors come with a number of control types. Hand controls are simple to steer and easy to change speed. These motors are normally transom mount motors and require a longer shaft so you can reach the hand control without having to bend over. 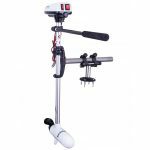 Cable controls and pedal controls offer very fast steering and are excellent for controlling your motor while fishing at the same time. These controls are mechanical versus power drive pedal controls, which allow you to control all functions of your motor through a cable virtually anywhere on your boat. The most popular and most modern form of electric motor controls is the fob type. They allow you to control your electric trolling motor with a remote control device. Fob type electric motor controls are extremely popular for those who love fishing as much as they love boating.